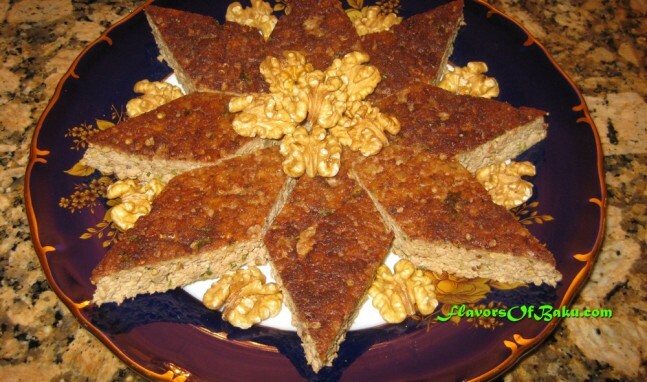 BADIMJAN KYUKYUSU (Eggplant kyukyu) is a national Azerbaijani dish made of eggplant, onion, walnut and egg. This great vegetarian dish is not only very tasty and unusual, but also nutritious. Serve this dish to someone and ask them to guess what it’s made of. Everyone will think that, because of the look and taste, that it is a meat dish. Peel the eggplants and onion, cut them into pieces, and grind in a meat grinder (or food processor.) It may be more comfortable to grind the vegetables into a colander set over a bowl so that their juices drain into the bowl. With a spoon, gently press the grinded eggplants and the onion against the sides of the colander to remove the remaining juices. 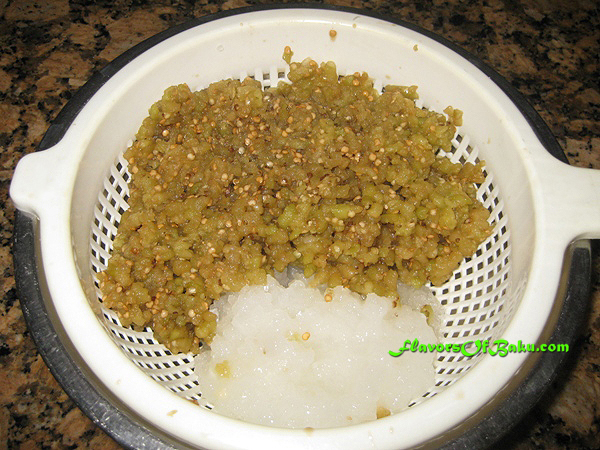 You can also remove the juice from the vegetables using a cheesecloth. Wash the cilantro, then pat it dry and finely chop it. Whisk the eggs in a large mixing bowl. 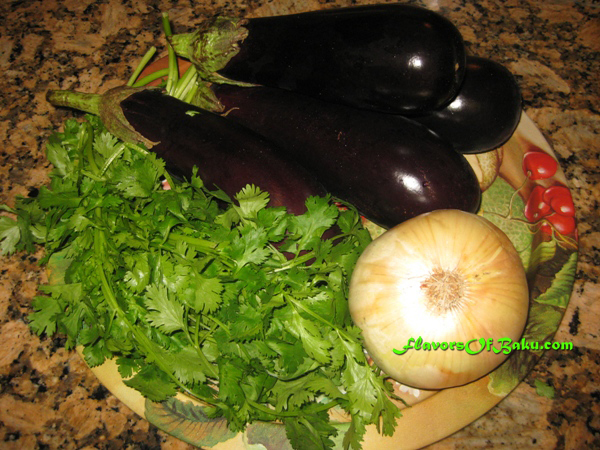 Add the eggplants, onion, walnuts, and cilantro and season with salt and pepper. Kyukyu can be fried in a pan or baked in an oven. If frying in a pan: pour 3 tbsp. of oil into a heated, non-stick frying pan. 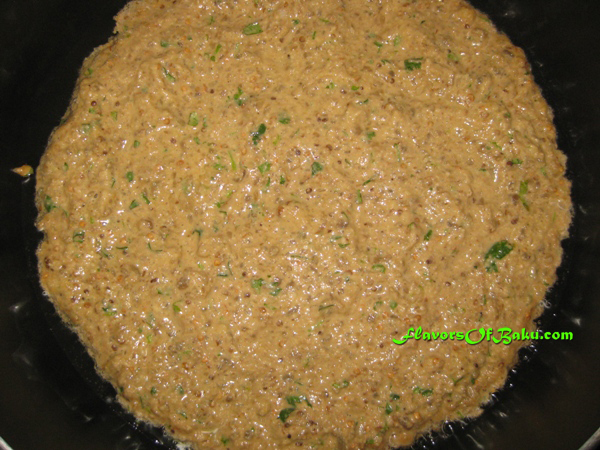 Pour the eggplant mixture into the pan, sprinkle 1 tbsp. of oil on top, and cook it covered with a lid over a low heat until the eggs cooked through and set. Turn off the heat, but leave the Kyukyu in the pan for an additional minute to absorb all the oil. If baking in the oven: grease a baking pan with 3 tbsp. 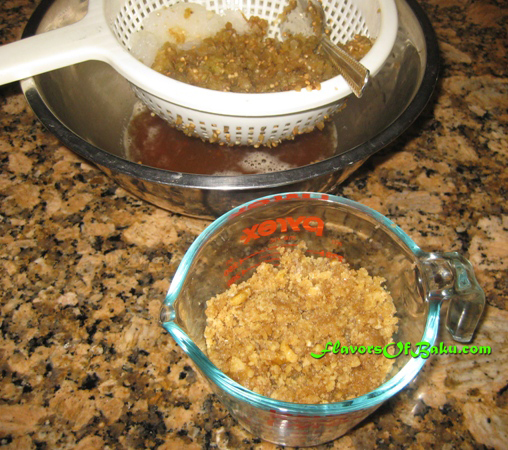 butter or oil, spread out the eggplant mixture within the pan, and sprinkle 1 tbsp. of oil or melted clarified butter on top. Bake in the preheated oven at 350°F (180°C) until the eggs are cooked. Turn the Badimjan Kyukyusu upside down on a plate and cut it into diamond-shaped pieces. Serve warm or chilled as an appetizer or as a separate dish. It can be also served as a garnish for pilaf.